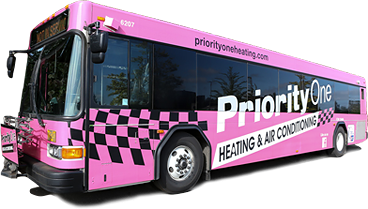 Priority One Heating & Air Conditioning was founded in 1998 by experienced professionals. We specialize in the service and retrofit of existing equipment for residential and commercial systems. Each installation and service call are backed up with a guarantee that exceeds the industry standards. We offer a 100% money back guarantee, a lifetime duct work guarantee, and 24-hour a day service with NO overtime charges. If your heating or cooling system fails, don’t panic! Simply call us anytime, day or night, and one of our technicians will be promptly dispatched to your home or office. In fact, most of the time, your system will be fixed the same day. It’s crazy but true, companies who charge by the hour make more money because they use low skilled technicians who take longer to make the repair. With qualified technicians, you pay a low flat rate, and you never pay for extra hours. We don’t just replace parts until your system starts running again. Our technician will do a complete evaluation of the system in order to properly diagnose and repair the problem quickly. Even if your system breaks down on a holiday, we’re available. In fact, we never charge our Savings Club Members overtime or after-hours fees. Our trucks carry a wide variety of parts. We specialize in older systems, so we’ll probably have the part you need right on the truck. If we don’t have the part on the truck, you won’t be charged for us to get it. Only 1 out of 30 applicants qualify. With the best training in service practices and customer service, we guarantee a quality job or you don’t pay. You can choose from many brands available. We don’t limit you to one brand. Priority One works for you, not the manufacturers. We may recommend one unit over another because of size, price, quality, or application that may better fit your needs. If you are not satisfied with our equipment, our people, or our service, we will refund 100% of your money. Our technicians and installers wear foot covers on their shoes, use drop cloths or runners, and vacuum when they are finished. We are not like the national chains that sell cheap systems and hire sub-contractors that cut corners to save time. Some companies do not carry the proper licenses for this type of work. They must have a CCB license, insurance, low voltage license, and continuing education. Many of the contractors in Lane County are not properly licensed. Your system is guaranteed to adequately heat or cool your home when installed with our recommendations, or we will install a new system for free. Only half of the total efficiency of a system is the result of the equipment; the other half is the quality of the installation. We evaluate the entire system, and your home, to ensure the best comfort and savings. Our team will perform a design analysis of your home for a custom installation, which will include sizing and load qualifications, at no cost or obligation. We reclaim, recycle, and properly dispose of all refrigerants and materials to reduce waste and environmental damage. We promise the best value. If you find a lower price on the same equipment, guarantees, and installation, we will refund you the difference plus $100. Your job doesn’t end with the installation; you will receive a free annual maintenance that keeps your system operating at top performance. I previously used a company that told me they couldn’t come out for several days when my heat went out. This was in spite of my having a maintenance contract. I changed to Priority One. I had them install a new system. The only time I had a problem they came out at 10pm on a Sunday night when our A/C wasn’t cooling enough. Service has been excellent. So has our heat and A/C. Repairing or servicing your heating or air conditioning system can save you money. If you need a new system, there are highly efficient models available that could pay for themselves by reducing your bills. Don’t put these decisions off.